..:recycled minds:..: B is for Beer & Y is for Yay! Short, but certainly not disappointing, B is for Beer offers a nice respite from the rigors of daily life at the beginning of a new summer. Crack open a cold one, sit down with your children, and have a read. 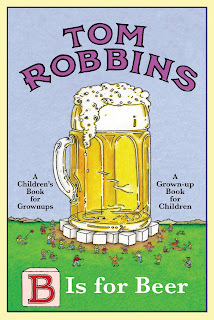 You'll be wanting more beer and Robbins in no time. I love Tom Robbins. Can't wait to read this latest adventure! He needs to write a new novel!